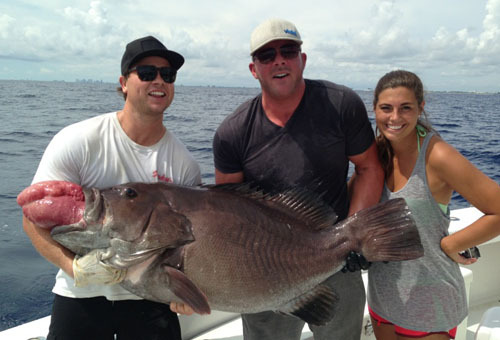 There is some great fishing this week in Fort Lauderdale. A lot of action on the reefs, wrecks and some big game fish mixed in too. First off, the reefs are holding a lot of bonitos and kingfish which have been great for us making for really easy action. When you’re trolling the reef, you also have the chance at hitting a wahoo or blackfin tuna. A few really nice wahoos were caught this week. Sailfish are biting sometimes on the troll as well, but they bite best fishing with the kites. 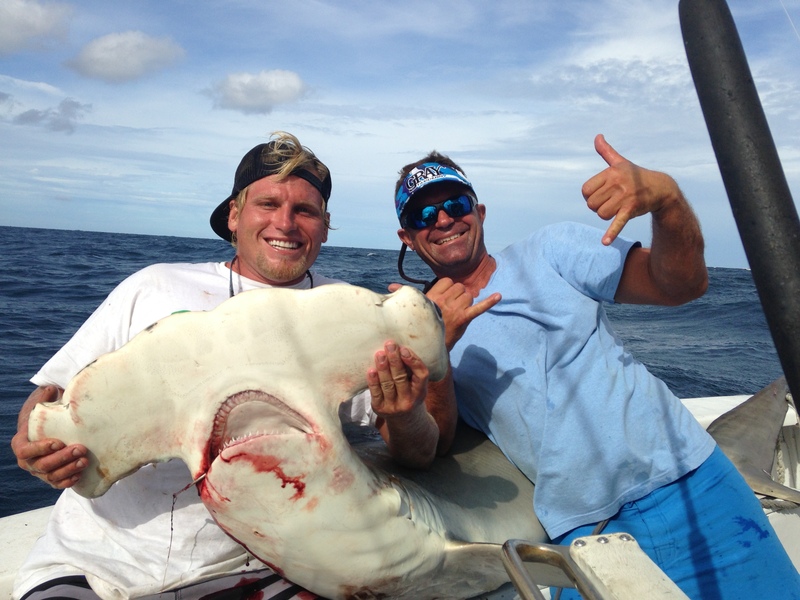 Kite fishing has been good lately for sailfish, mahi-mahi, barracuda and some really big sharks. Sailfish season is approaching us rapidly and they are already beginning to bite. 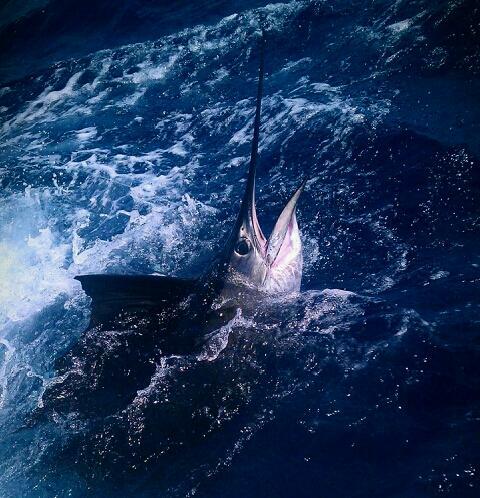 Our boats have had 3 days this week where we caught multiple sailfish in the same trip. Shark fishing has been outstanding these past few weeks and it doesn’t seem to be slowing down. Hammerheads, dusky, sand bar, black tip and spinner sharks are biting good fishing with the kites using live baits or fishing the bottom with big, bloody shark baits. 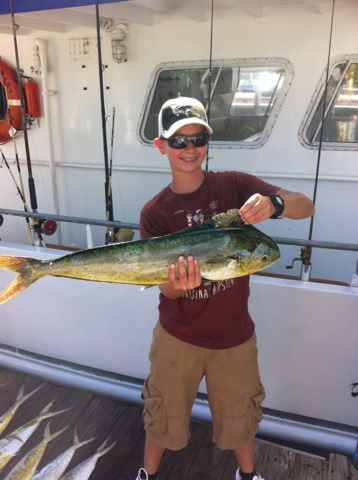 Offshore mahi-mahi fishing is becoming more productive. Weedlines are forming up nicely in 700ft of water, about 5 miles offshore. This is perfect territory for catching mahi-mahi dolphin, tuna and wahoo by dragging lures and rigged baits. These past 2 weeks, the all day dolphin trips that we run have been doing great catching dolphin like this offshore. There’s a lot more fish around this year it seems. Last year, the fishing was relatively slow but things seem to be strengthening nicely this year. 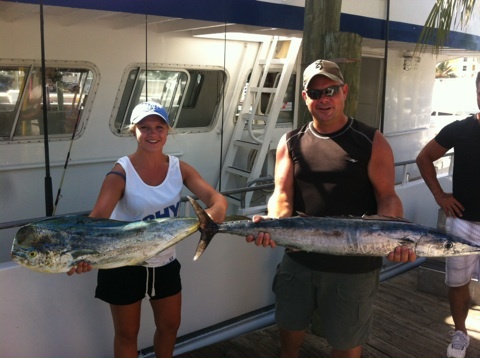 Our sportfishing charter boats, the Big Game and Out of the Blue are consistently coming in with the best catches. Good luck fishing this week everyone, I’ll sea ya on the water. Great fishing today on the All Day Trip aboard the Mary B III. We heard there were some dolphin offshore, so we ventured out about 5 miles offshore. Trolling around out there, we found a nice weedline formed. We started getting bites right away… 1 dolphin, then 2 more, etc. The dolphin were hitting pretty steady for a couple hours. 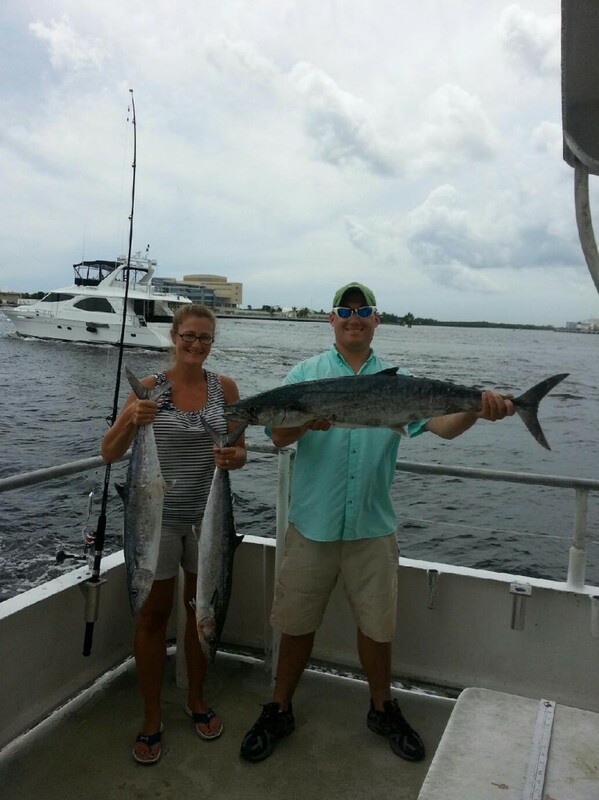 We caught 4 wahoo mixed in the catch as well. One we got into the heat of the afternoon, the dolphin slowed down. Capt. Kevin decided to come into 300ft of water and do some deep dropping. We deep dropped with chicken rigs and caught another 20+ tilefish before we had to call it a day. The fishing action was excellent, hardly any down time at all without fish on the end of the line. This is a great time of year to fish the All Day Trip because the dolphin are moving through and with 8 hours to fish, we have time to go out that far and troll around for them. The wahoos we caught were just awesome too. All the wahoo bit on the deep planer baits. The past couple weeks has been good action on all our trips. 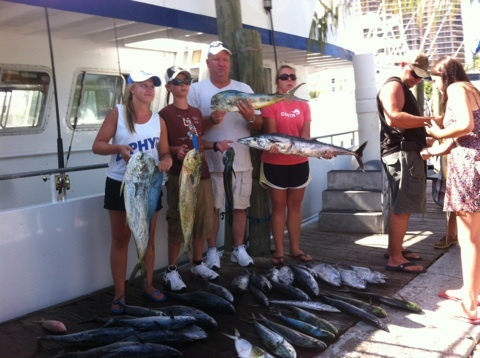 The daily deep sea drift fishing trips are catching bonitos, kingfish, snapper and grouper. Kingfish are starting to bite better and better this time of year. On our sportfishing charters, we’re also getting good action on bonitos and kingfish, but we also have been getting some sailfish, wahoo and blackfin tunas. 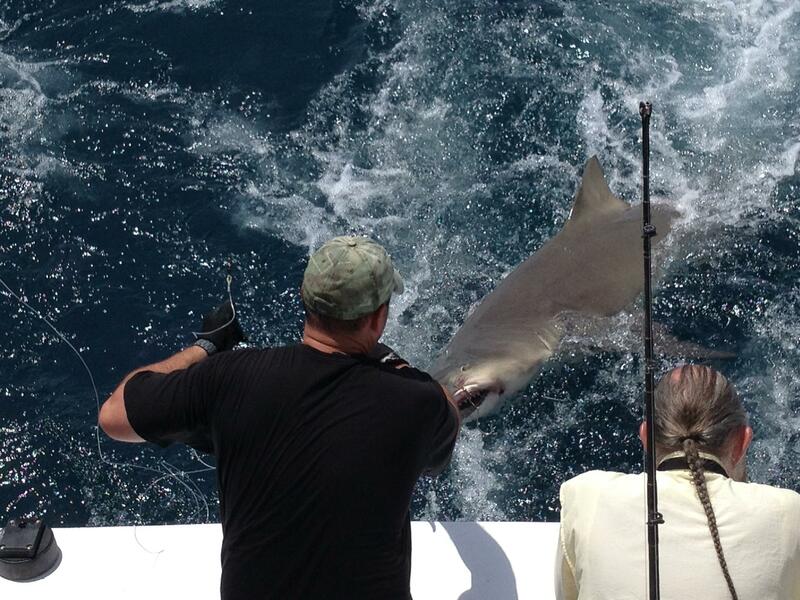 Some monster sharks are biting out there too, and our crew on the Out of the Blue specialize in shark fishing charters. We’re closing in on the end of the summer fishing season, so the bonitos are slowing down. But the action on kingfish is improving, mahi-mahi dolphin are biting offshore, wahoos and sailfish are around and there is plenty of action to be had bottom fishing. Good luck to everyone fishing out there this week. I’ll sea ya on the water! That's the look of a happy angler! Nice dolphin caught on the 8 hour trip. The fishing is great in Ft Lauderdale this week! There is a lot of action on the reefs with plenty of bonitos and kingfish around. 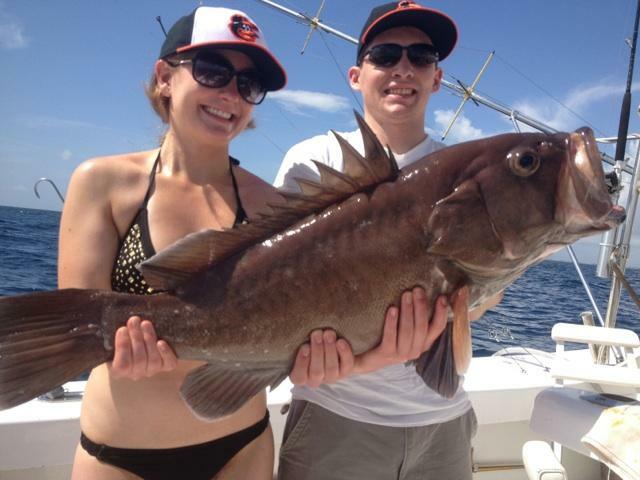 We’re catching these on both our drift fishing trips and our sportfishing charters. We’re also getting a lot of nice fish off the bottom this week. Some big groupers are biting out deep and the snapper bite is hot. 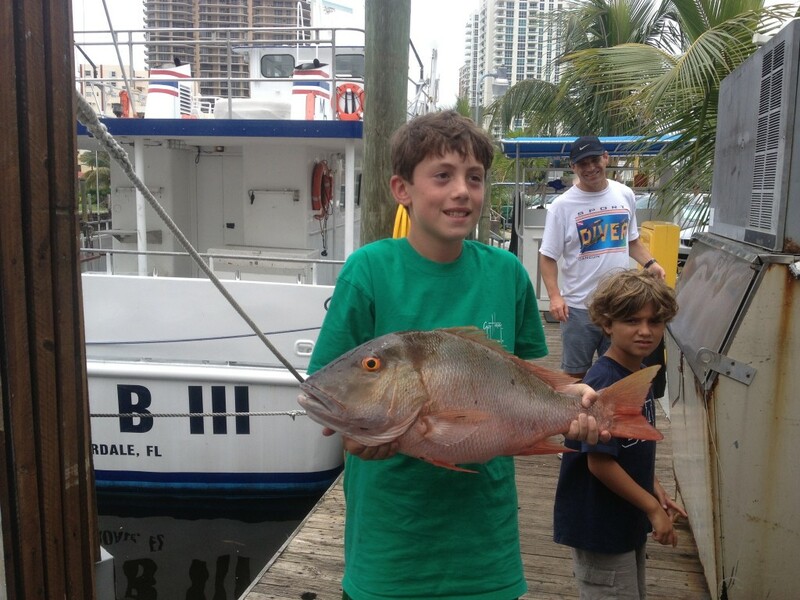 In shallow, approximately 40-100ft of water, mangrove snapper, muttons and black groupers are active. Out deeper, in 300+ feet of water, the vermillion snapper are chomping and there are a few nicer groupers around too, warsaws and snowys. The fishing action in Ft Lauderdale in August is always good. Bonitos, a fish in the tuna family, make their annual migration down our coastline in massive schools this month and next. They run in schools, tearing up any baitfish they come across. Kingfish, blackfin tuna and wahoo are swimming right with these bonito schools, competing over the same schools of baitfish. The aggressiveness of the bonito schools make all the other fish more aggressive too, so you can hook into some pretty large and exotic gamefish this time of year. Snappers and groupers bite great in the late summer, especially at night. While we catch our fair share of snapper and grouper during the day, at night the snappers come out of the woodwork to feed and the bite goes off! 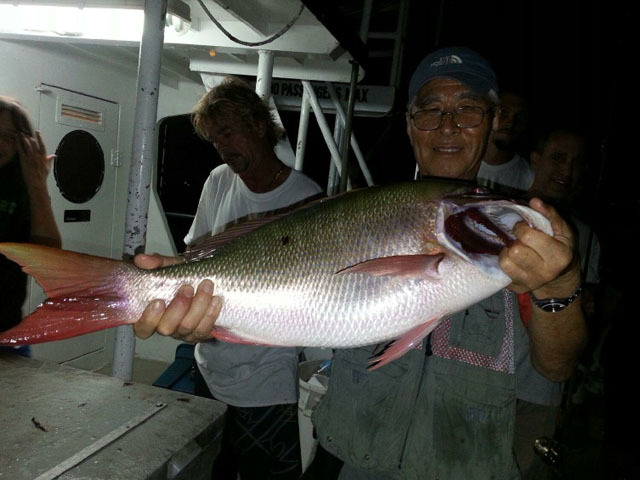 Yellowtails, mangroves and mutton snappers are biting excellent. The best technique for targeting snapper at night is to anchor the boat and chum the water. This draws the snappers and all the other reef fish close to the boat where we can drop to the bottom and catch them. A lot of sharks, some kingfish and the occasional cobia also bite on our night trips. The fishing is good in Ft Lauderdale. 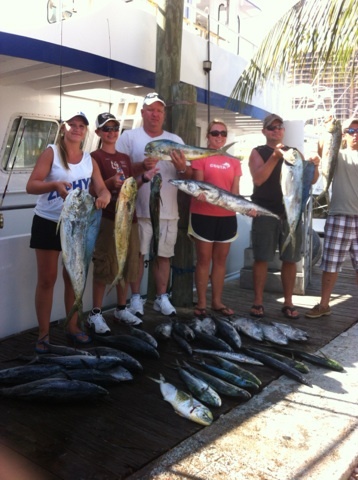 If you’re coming on the drift fishing trips, I recommend morning for kingfish and bonitos, afternoons for tuna, snapper and grouper and nights for pure snapper fishing. On the sportfishing charters, afternoon fishing has been slightly better with the tuna and wahoos biting better at that time of day. Call me anytime if you have any fishing questions. Good luck to everyone fishing this week, I’ll sea ya on the water.